You're only 30 minutes away from a fiesta of flavours in an easy one-pan dinner! 1. Heat the oil in a large 25 cm oven-safe non-stick frying pan or shallow casserole dish and cook 3/4 of the spring onions for 2 to 3 minutes, over medium-high heat. Stir in the spices and cook for 1 minute before adding in the beef mince and continuing to cook for 5 to 7 minutes, until beef is thoroughly cooked. Stir in the salsa and sweetcorn, and season with salt and pepper. Bring to a boil then turn down to medium-low heat and cook for 4 to 5 minutes. 2. Preheat the grill to medium-high. 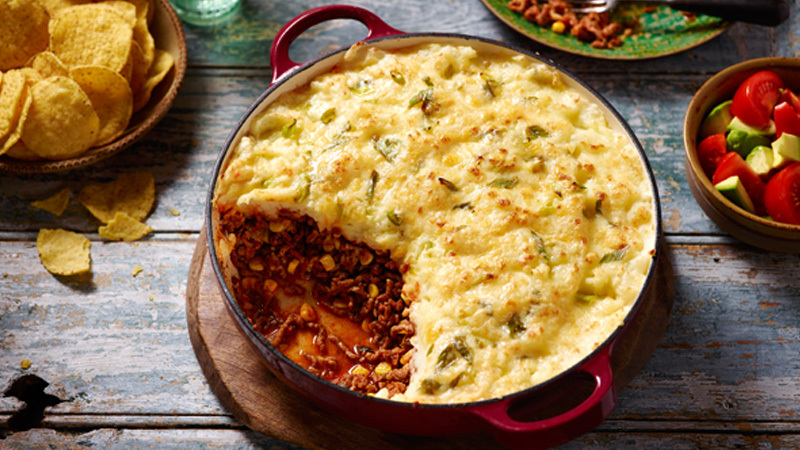 Spoon the mashed potato over the mince mixture and sprinkle with the cheese and reserved spring onions. Cook for 10 minutes, until the cheese has melted and is starting to brown. To save time, cook the beef mince and onions ahead of time then chill in the fridge until you prepare the recipe.